Maintaining condo security is an important topic. Over 60 million people across America live in condos. People enjoy convenient, low-maintenance residences in top cities such as Seattle. Residents who choose this preferred lifestyle need to feel secure in their homes. 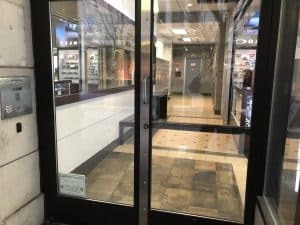 A reputable Seattle locksmith service understands the unique needs of each condo complex. Sevan Locks & Doors is there to offer practical condo security tips and services to keep residents safe. Condo security systems differ, based on the number of units, location, and other factors. A skilled locksmith helps condo management and owners find the right condo security system. Customization is key when it comes to maintaining the highest level of security. The professionals at Sevan Locks & Doors work with each condo customer to ensure their security requirements are met or exceeded. The experts at Sevan Locks & Doors offer customized hardware and condo security systems. The local hardware store cannot give you this level of customization. We specialize in creating a condo security system to accommodate any condo complex. The goal is to keep everyone feeling secure in their homes and on the premises. Telephone entry systems enable residents to unlock the door from anywhere by using their phones. Residents can see and know who is coming to their homes. Sevan Locks & Doors provides access control systems installation services for condos, including intercom and telephone entry systems. A basic system is programmed from the keypad. Visitors look up residents by the last name to contact them on a particular number. The resident chooses whether the visitor gets access. Advanced systems feature a larger display that can be programmed over the Internet or via a modem. Residents can view visitors to determine if they are acceptable for entry or potential intruders. Many condo security systems include keycard access control. The user has a keycard or fob to access a door or area. Access control systems can also use methods such as a password or pin. Through the installation of a keycard access control system, Sevan Locks & Doors lets you decide who should have access to certain areas. Access control points may include a door, gate, elevator, turnstile, or other physical barriers. Our condo security professionals will help you choose the right keyword access control system for your individualized needs. 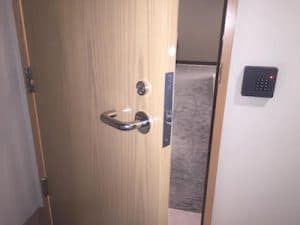 Custom security door astragals help prevent break-ins. Intruders look for exposed door latches and insecure areas that can be used to pry the door open. Quality astragals are custom-made from stainless steel or silver hammer-tone finish to fit your condo’s entry door. A smart design prevents intruders from accessing the electric strike and prying the door open. Astragals are customized and cannot be found at your local hardware store. Single astragal plates just protect the deadbolt and knob area of the door. Full-length interlocking astragals are superior because the height protects the entire door. Sevan Locks & Doors installs astragals for any door, including single doors, double doors, metal doors, and doors that open outward. People wrenching away at the door levers and knobs is another major security issue for condo complexes. 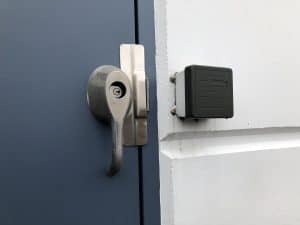 Custom knob and lever guards help protect entry doors from damage and intruders. Much like astragals, door hardware guards cannot be found at your corner hardware store. Our experienced locksmiths can easily install lever guards to fit perfectly over your current hardware. The hole makes it simple to put in a key and turn with a built-in handle to open the door with ease. Condo security is a high-priority issue to keep residents safe and happy. Customized security solutions are designed specifically for your property. Contact Sevan Locks & Doors to find out more about maintaining optimum security at your Seattle condo complex. For any and all security problems, give us a call today. We at Sevan look forward to helping you quickly resolve your issues through courteous and knowledgeable service using high-quality, durable products. Why? Because your security, convenience and satisfaction are our highest priority.